The drawing, which Leonardo called a Mazzocchio, comprises 32 octagonal sections. 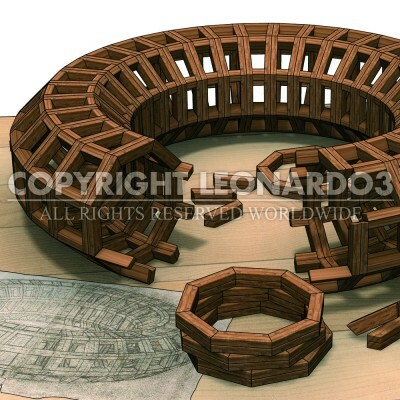 It is a very complex axonometric projection, since each plane of the toroidal solid with its octagonal sections form a hollow frame that reveals the underlying structure. This is not just an exercise on paper. In the manuscript, Leonardo suggests a method to build a version of it in lead. The small drawing to the left of the main figure (next to the text) represents the section of one of its 512 components. The fragment reproduced in this panel gives a calculation of the pieces needed for lead model: a total of 2048. 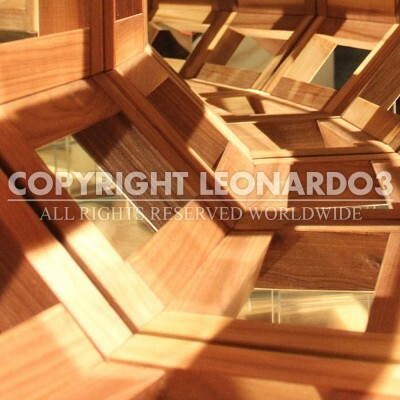 Leonardo writes: In order to make it, you must use thick glued paper; cut the pieces into the two basic shapes that make up the Mazzocchio, then assemble all the piece of paper and hold them together some thread, then pour liquid wax into the paper shapes. The total number of pieces is 512: 256 rings and 256 joints. If you want to make pieces in lead, as is done with printing characters, the pieces are the same as those in wax, and by making the calculations, the number of pieces required total 2048. The Mazzocchio then had to be assembled by attaching the pieces together using a sort of soldering technique.